The BEST WESTERN PLUS Seville Plaza Hotel offers first-class business amenities and a convenient location close to numerous businesses; an excellent choice for all business travelers. Located near downtown Kansas City, our Kansas City Business Hotel provides easy access to many major businesses, including the Crown Center, Hallmark Cards, Federal Reserve and the Union Station. Guests here to participate in an event at the convention center will be pleased with the proximity of Bartle Hall. Visiting doctors, staff and students will have no problem getting to St. Lukes Hospital and the KU Medical Center, and faculty and professors here for a semester will enjoy the easy commute to the University of Missouri at KC. We also are a home away from home for employees with the Nelson/Atkins Museum, Sprint Center, the Power and Light District and the nearby Country Club Plaza. With free shuttle service on Fridays and Saturdays from 4pm-12am, and on an individual basis with prior notice, there is no reason to worry about getting around. Our shuttle services the Plaza, Power and Light District, Westport, and anywhere within 3 miles of the hotel. Special requests for the shuttle on any other day are requested to be made in advance. We also offer a complimentary hot and cold breakfast daily with all of your breakfast favorites. Business travelers especially need a hearty breakfast to get their busy work day started on the right foot. Don’t miss our complimentary managers reception including beer and wine, on Fridays from 4-6pm. Our convenient access to numerous shops, restaurants and attractions also makes it simple to get in some sightseeing and relaxation in between meetings and appointments. 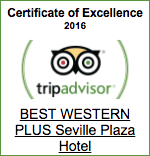 Book a room at the BEST WESTERN PLUS Seville Plaza Hotel today.